The Small migrating birds mittens, or Muuttolintuset in Finnish, are finished. All in all a pleasurable knit. 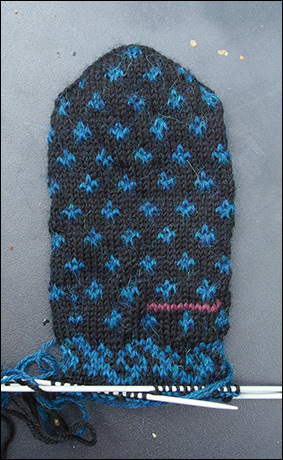 The fringe, done last after the mittens were knitted from the fingers down to the cuff, is knitted according to the instructions in Anna Zilboorg’s book Magnificent mittens. When I started these mittens I was a little bit bored with always doing things the same way, and I therefore decided to do it upside down. These mittens should be knitted from the cuffs up, using the fringe I earlier have done a tutorial to. But it was fun to for once doing in other wise, and now I’m very at ease with knitting the traditional way again. Pattern: Muutolintuset from Jalasjärvi, from Eeva Haavisto’s book Sataa kansanomaista kuviokudinmallia. Needles: 2, 5 mm dpns. 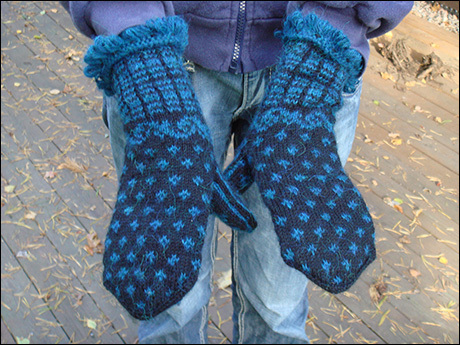 I have been quite busy with other things, and only got my act together to take pictures of the first mitten pair. 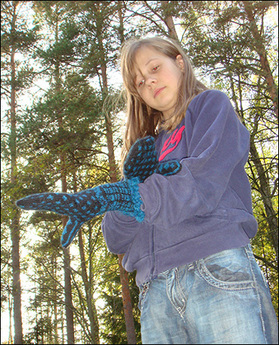 Or to be exact, the first mitten of the first pair. This is yet another model from Eeva Haavisto’s * book Sataa kansainomaista kuviokudinmallia. And once again is Eeva Haavisto given the origin of the pattern to Jalasjärvi in Pohjanmaa. The upper part of the mitten has a pattern that is well known in a much bigger part of Finland than only Pohjanmaa, and was called “small migrating birds” or muuttolintuset in the south of Finland. The pattern under the thumb is the in Pohjanmaa often used renaissance pattern “ässänväärä”. I don’t think this pattern was used in other areas at all. The mittens will have a fringe at the end of the cuffs. The yarn is black merino wool (the old Novita Wool, from when it was only made from merino) and blue/teal Drops Alpaca. The alpaca yarn will make the mittens lovely warm, since it will be stranded on the inside a lot. 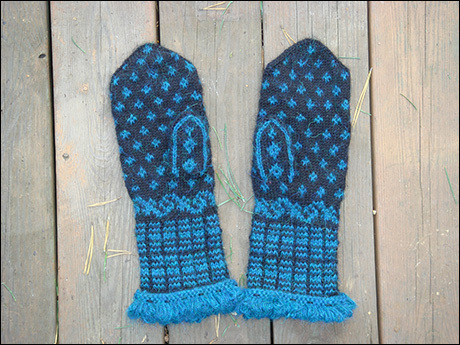 Needles 2,5 mm dpns, and mittens started from the top down the way Anna Zilboorg describes in Magnificent mittens. *I know this might be like putting salt in wounds for you who have no chances to find the book. I’m so sorry, but I can’t help knitting from it. It’s a treasure. But I promise, if I ever will find an other copy of it, it will be for sale.